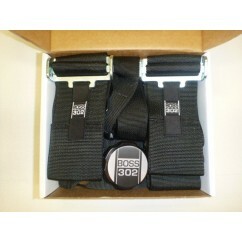 This is air to oil cooler that has been designed for the 2012+ Boss 302 and 2011+ Ford Mustang GTs. 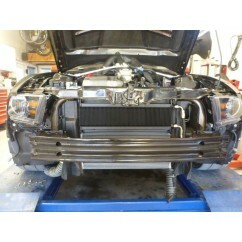 This Oil Cooler Kit is intended for both street and track driven Mustangs. As of June, 2017, this kit has been upgraded to include theromstatic control at a great price point and a simplier install!! Ford Mustang enthusiasts who engage in track events where the ambient air temperature can be more than 80 degrees likely already know that these cars can run very high coolant temps. In addition, for those that have equipped their car with an oil temperature gauge, it should be no surprise that oil temps can be similarly very high. On these high-revving Coyote motors, oil temps can rise significantly when the car is driven in the 5000-7000 RPM range which is typical in a road course event. At least the Boss 302 Mustangs employ an oil cooler from the factory but this is a water to oil cooler. The challenge in warm-weather track conditions is that the OEM cooling system is simply over-taxed. Engine coolant which can be at 230F degrees or more is also burdened with trying to cool the oil which can be as high as 300F. This is a no-win situation. First, by trying to cool the engine as well as the oil, the hot oil simply causes coolant temps to continue to rise. Second, the affectivity of the 230F + coolant in trying to cool 300F oil is a compromise at best. 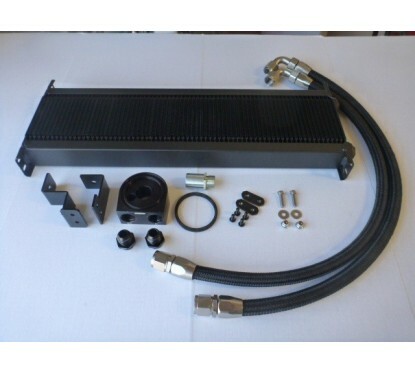 This air to oil cooler has been designed to add to the OEM cooler for an in-series operation. 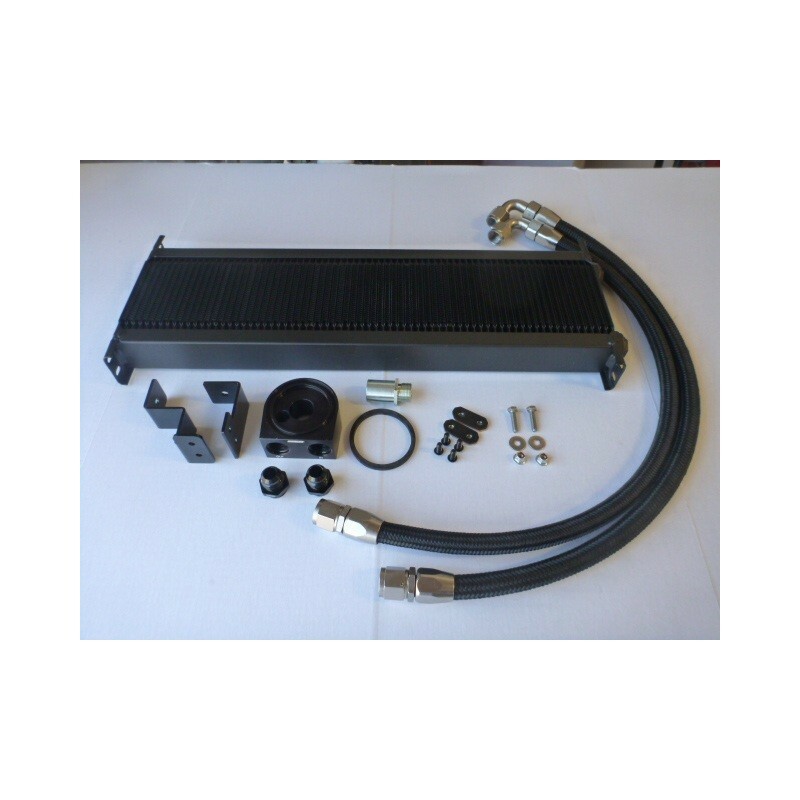 This version of our Oil Cooler Kit NOW INCLUDES a thermostatic sandwich plate! As of June, 2017, we have consolidated our two oil cooler options for the Boss Mustangs! Previously we had a kit with a remote oil filter and thermostat. This was a GREAT kit and is used on many track Mustangs but with the introduction of a thermostatic sandwich plate at the oil filter, we can now simplify the kit. We now only need to supply (2) hoses - fewer points of failure AND a simplified installation. 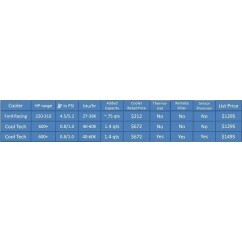 Best of all, we are manitaining the same price as we had for a non-thermostaically controlled kit! You get the best of both worlds in one kit! The kit also increases engine oil capacity by approximately 1.2 quarts - further aiding engine cooling and oil life longevity. 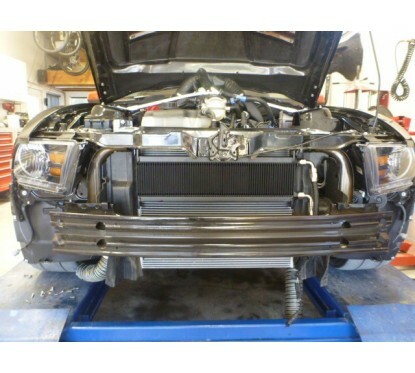 The "coyote" engine in the Mustang GT's and Boss 302's employs a high performance oil pump. Oil pressure at start up is often over 90psi. Even when fully warm, oil pressures can exceed 80 psi at max rpm. It is important that a high-performance heat exchanger is used. 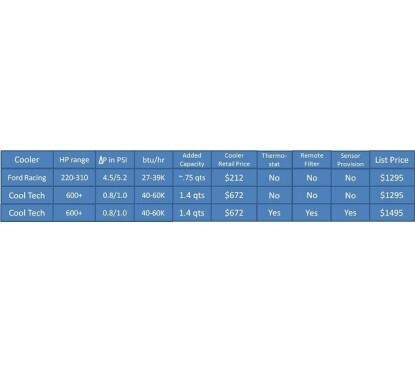 Cool Tech consulted with Setrab in selecting a cooler that was large enough to get the job done AND that had the best flow and least pressure drop of virtually any cooler on the market. This Setrab cooler was originally spec'd to meet NASCAR requirements and now often used on Porsche race cars. The trade-off is that this is NOT an inexpensive cooler. The street price of the cooler alone is $600+. Similarly, Cool Tech uses other very high performance components including nickel plated -10 AN fittings. 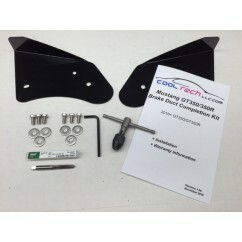 Everything is included in this kit including complete illustrated install instructions. Quality Materials - All top-end components from the cooler to the lines & fittings.